All the trellis is 6ft (1.83m) wide and then varying heights, The gap size is approximately 110mm (4¼’). The dome has been cut and capped to give approximately a 300mm curve with all measurements taken from the highest point. 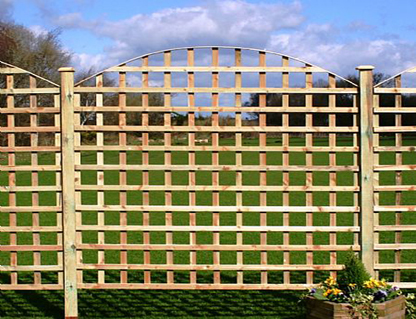 This trellis is made from a 18x38mm batten that has been pressure treated for longer life. This trellis can be utilised with our scalloped trellis to give a �wave� effect.